Herbsmith is a proud member of the National Animal Supplement Council. Members of the National Animal Supplement Council (NASC) are concerned and committed manufacturers of animal health supplements across the globe. Together they endeavor to improve the quality of these products sold to consumers for the benefit of their and companion animals and horses. NASC’s overriding goal is to promote the health and well-being of animals that are given health supplements by their owners, and to protect and enhance the integrity of the animal health product industry. NASC advocates and collectively enforces Good Manufacturing Practice Quality Standards in manufacturing, labeling and marketing animal health supplements. In addition, NASC members establish fair and reasonable paths to fund and facilitate the collection and dissemination of statistically significant research, as well as actively participate in programs of continual vigilance ensuring the quality of ingredients in these products. Through its diverse, member-directed activities, NASC brings about understanding among manufacturers, retailers, distributors, federal and state regulators, veterinarians, the media and animal owners about the importance of safe, high quality products for the health and well-being of companion animals. 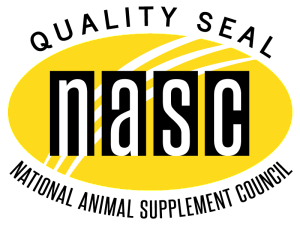 Consumers should look for the NASC Quality Seal. Purchasing products from NASC members is the best way consumers can support efforts to improve the quality of animal health supplements!